The fakes are everywhere. At this point, it might be easier to just point out the images on the internet that are real, rather than show you all the fakes that have been circulating recently. Then again, this way’s always more fun. 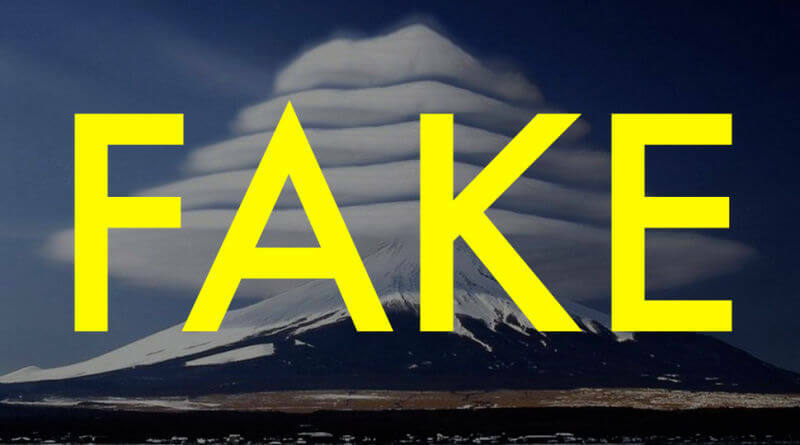 1) Are these strange clouds over Mount Fuji real? Lenticular clouds sure are cool looking. But the image on the left is just a Photoshop job. This fake image has been around for at least a couple of years now, but it keeps getting passed around as real again and again. Stop it, guys. Just stop. 2) Are these the founders of Harley-Davidson? In the early 1900s William Harley, his friend Arthur Davidson and many of Davidson’s family members all teamed up in Milwaukee to create one of the most iconic companies of 20th century America: Harley-Davidson motorcycles. But is the photo above really of William Harley and Arthur Davidson in 1914? Nope. The always amazing PicPedant did a little research on this photo only to discover that (surprise! surprise!) it’s not what so many people on the internet claim it to be. Turns out the photo is just two random motorcycle enthusiasts from Minnesota. I was enjoying your page with all the old Harleys and remembered that I have a photo of my cousin’s grandfather and his grandfather’s brother each sitting on the brand new 1914 Harleys that they purchased in 1914. I am not sure, but I believe the photo may have been taken at the dealership (probably not really a dealership back then, but the guy must have been an HD distributer) in Wanamingo, MN. Below we have a photo of William S. Harley (right) and William A. Davidson (in sidecar, and father of Arthur Davidson) in 1924 from theAMA Motorcycle Hall of Fame. 3) Is this the Heart River in North Dakota? People pick on North Dakota. So it’s nice when the state gets a little love. But sadly the love heaped upon it by the internet recently is for somethingnot real. The Heart River is very much a real river in North Dakota. But the image above was created by the Vienna Paint digital art studio. The real Heart River looks nothing like that from the air. 4) Is this lightning striking a tree? Nope. This is a long-exposure light manipulation photo with a lightning bolt photoshopped in. As the Museum of Hoaxes points out, this image was created by Darren Pearson, who also goes by the name Darius Twin. Pearson does some very cool work, but they’re all heavily manipulated photos in some form or another. 5) Is this the space shuttle breaching the clouds? It’s a cool image, but of course it’s too good to be true. The creator of the image on the left, Richard Silvera says quite plainly, “This image is a composite of 2 pictures.” An almost equally cool photo that shows thespace shuttle Challenger still on the ground in November of 1982 is on the right and is definitely real. 6) Is this a picnic on an American highway during the 1973 oil crisis? I’ve always wondered about this photo, since I’ve seen it pass through my social media streams at least a dozen times in the last year. It purports to show Americans having a picnic on a major freeway in 1973. The 1970s oil crisis was devastating to American motorists. There were shortages and Americans often had to wait in long lines to fill up their tanks. But the highways didn’t suddenly become empty. Well, as Hoax of Fame points out, the photo isn’t American at all. The image actually comes from The Netherlands. It was taken in 1973 when the country imposed “Car-Free Sundays” which would occur periodically during the 1973-74 oil crisis. Below, another photo from a car-free Sunday in 1973. 7) Is a this a meteor over Stonehenge in England? No, that’s not a meteor over Stonehenge (or Stonehedge, as this misleading tweet calls it). For whatever reason this image just won’t die, getting passed around on Twitter, Pinterest, and Tumblr again and again. The photo shows a very real fireball meteor over Oklahoma in 2008. But some jerk put it behind Stonehenge and suddenly it just won’t go away no matter how many times astronomy sleuths like FakeAstropix debunk it. 8) Is this photo of “kissing islands” in Greenland real? No, those aren’t islands that just happen to look like they’re human faces tenderly kissing. It’s yet another ad campaign. But strangely, some people are cropping out the Pfizer logo and claiming that they’re real islands. The Italian branch of international ad agency Saatchi & Saatchi appears to have come up with this one. On the right, another image from the campaign that appears to show some kind of brain/headache message. And since Pfizer makes Viagra, we might safely assume the one on the left is for that little blue pill? Either way, it’s as fake as they come.